(Oregon Coast) – It's winter, so some interesting things may start popping up from beneath the dunes. 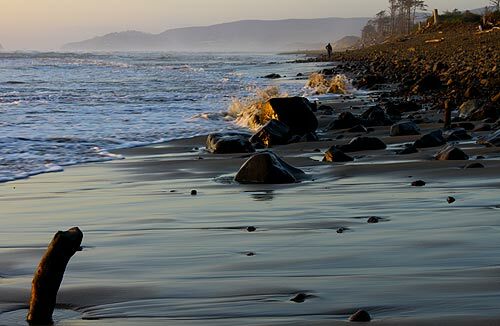 Keep a look out for more than just agates, as 2000-year-old objects may showing, surreal shapes of something called “iron towers” - and there's a new way to look at the dunes of the north Oregon coast. (Above: a ghost forest stump in the unlikely place of Cape Lookout, near Oceanside). Ghost forests will likely start appearing on the Oregon coast soon, if they haven't already. Winter storms typically dredge up enough sand to bring at least a few out. These ghost forests are nothing short of jaw-dropping, if you know what you're seeing. At first, they appear like old manmade pilings in the surf, as if it was an old pier structure left abandoned. But they are parts of a forest that can be thousands of years old. 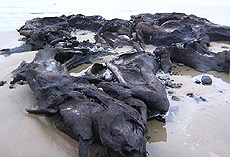 Radiocarbon dating of these stumps has put them as old as 5,000 years to some as young as 1400 years old – depending on the location. (At right: Newort ghost stump). 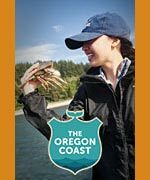 While Neskowin has them year-round, there are 45 locations along the Oregon coast where you could find them. 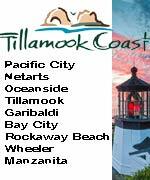 Over half are on the central coast area, in and around Newport and south of Lincoln City. There also quite a few to be found just south of Cannon Beach, in and around Arch Cape. 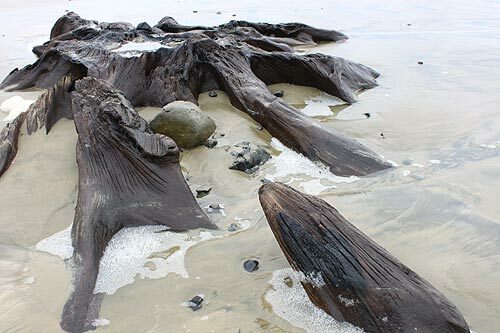 You can see a complete guide to Finding Oregon Coast Ghost Forests here. Another curiosity to keep an eye out for are “red towers” or “iron towers,” as sand levels start decreasing because of storms. It's not guaranteed, but some winters are raucous enough to make these show up. Mostly, they seem to appear around Hug Point and Arch Cape, just south of Cannon Beach. 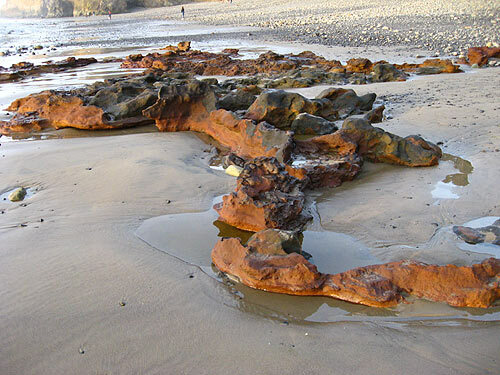 These really surreal, Dr. Suess-esque red towers are conglomerations of iron and other elements that form surreal reddish structures beneath the sands. They are odd-shaped structures that resemble mushrooms a bit. Seaside geologist Tom Horning said the sand towers – only a couple feet high, if that – are basically beach sand cemented by red iron oxide. They stay strong enough to not be destroyed by the tough objects that batter them if they’re kept under the sand most of the time. While you're looking for these freakish tidbits, you may interested in a new perspective on some of the regular sites near Warrenton and Seaside. There's more to the story here, too. 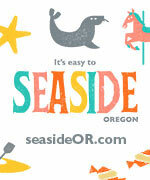 You may be surprised to know many of the dunes on the north Oregon coast didn't come about by entirely natural means. 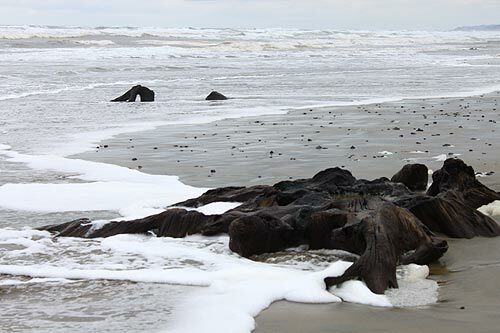 In fact, chunks of Fort Stevens didn't even exist before 1900, and the same is true of dunes around Gearhart, Seaside and much of the area up to Warrenton. It all began with the construction of the jetties at the Columbia River around 1890. This changed currents and sand distribution dramatically. Other elements became involved as well, all essentially initiated by Man. The sand dunes started flowing and moving around so much that beach grasses were brought in to stabilize things. These were essentially invasive species, which did their job keeping things down but those grasses basically invaded Oregon and Washigton over the decades. During this time, the rate that sand expanded in a westerly direction went from a couple feet per year to as much as 35 feet per year. Astounding. 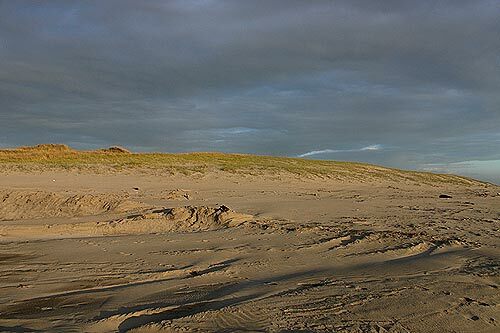 The result were dunes that grew out from the beaches by as much as 2000 feet in some spots, and as high as 45 feet. You can read even more at the story, History of North Oregon Coast Dunes Reads Like an Alien Movie. 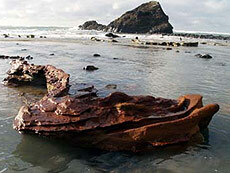 Even more on these subjects at the Oregon Coast Geology page. Below: more ghost forests and a red tower.